So as we all know, "New Moon" has been destroying the box office; however, this post has nothing to do with "Twilight Saga." During the previews, the trailer for the "The Lovely Bones" played, and it really caught my eye. 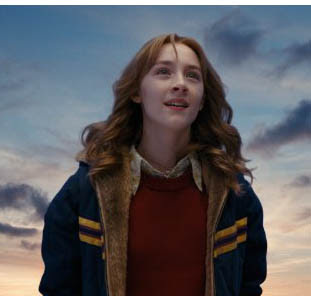 So this week's wonderawesomely awesome s/s goes to Saorise Ronan, the principle star of the flick. I saw the first few moments of the preview, and it looked like "OMG another girly movie about dullness and boredom." You may remember Saorise from the award winning picture "Atonement," where she played some little girl. No, jk. "Atonement" was actually really good. And I liked the ending. I don't care what anyone says. Actually, by not going to see New Moon you would still be cool... just to a different group of people. duuuuude. kemp and I have been freaking out over the lovely bones since we saw the trailer back in september or october. they pushed the release date back to january and I want to personally throttle peter jackson. book was so good. dayyum. the end is a total piece de resistance. Saorise (I read somewhere it's pronounced "SHUR-sa") is going places. she was pitch-perfect in atonement. DAMMIT, why wasn't atonement nominated for more academy awards? I hope this movie lives up to my wildest fantasies. Because this is one of the few (very, very few) movies I am excited to see. You know. Mark wall-e-burg is also in it. And I used to really dislike the guy, but now him and I are on good terms. Cheers. who could NOT be on good terms with mark wizzalburg after boogie nights? yeah, exactly I became a fan of marky dub after watching Boogie Nights. "dirk"
ps: i wanna see him in "The Corrupter" avec Chow Yun PHAT! my favorite post ever by you Al! EVER!